The short story 'The Adventure of Johnnie Waverly', first published in The Sketch in 1924, was chosen as the third episode of the first series of Agatha Christie's Poirot. The screenplay was again by Clive Exton and the director was Renny Rye, in his first Poirot outing. Given that the short story in question is one of the shortest in Christie's Poirot canon, some plot elements had to be expanded and changed on the journey from source material to screen adaptation. However, nearly all the dialogue from the short story is kept and the expansions and additions work, most of the time. The most important change between the short story and the adaptation is that Mr. Waverly consults Poirot before the actual kidnapping, instead of afterwards. This makes complete sense, because it is much more enganging for viewers to see the case unfolding in "present time" rather than through Waverly's retelling of it. Curiously, however, the Waverlys do not consult Poirot together, like in the short story. I don't understand that particular change at all. For one thing, the two consulting him together would make more sense since they are both supposed to be concerned parents. But what puzzles me is why Mr Waverly (on his own) would consult Poirot at all. It would make sense for him to consult him under the pressure of his wife, but the adaptation suggests that he is the one who initiated the consultation. Of course, it is not uncommon in Christie's stories that SPOILER the culprit himself consults the detective, but why change it in the first place? In any case, the restructuring of the story means that Poirot and Hastings visit the scene of the crime before the kidnapping takes place. In other words, every detail mentioned in Waverly's retelling to Poirot in the short story is here expanded and visualised. Poirot and Hastings are present when Mrs Waverly is ill and when Mr Waverly sacks all the servants. Also, Exton adds some apparent money trouble in the Waverly household, with Hastings remarking on the lack of food and a construction worker pointing out where the money lies (with Mrs. Waverly, not Mr. Waverly). Moreover, the inspector from the short story, Inspector McNeil, is substituted with the ever-present Japp. While it is something of a stretch to have Japp handling almost every single one of Poirot's cases (and in terms of broadcast order, he has been in all episodes up to this point), his introduction here makes sense, particularly because Exton has added a scene in which Poirot and Mr. Waverly jointly visit Japp in his office, and it is implied that Poirot uses his influence (i.e. Japp) to bring the kidnapping to Scotland Yard's attention. In other words, the inclusion of Japp actually makes sense in this particular instance (and, of course, it is great to have Philip Jackson and David Suchet develop the Japp-Poirot relationship, so I am not objecting!). Miss Lemon is also added to the adaptation, in its opening scenes. Again, Exton's change makes complete sense, since Miss Lemon is employed by Poirot at this point in time of the Poirot series (but was not at the time the short story was published). Also, he makes use of Miss Lemon's famous filing system (referred to by Christie in the novel Hickory Dickory Dock), so her scenes are not entirely his own fiction - they are actually based on Christie. Hastings, who is present in the short story, is given a new subplot, too. 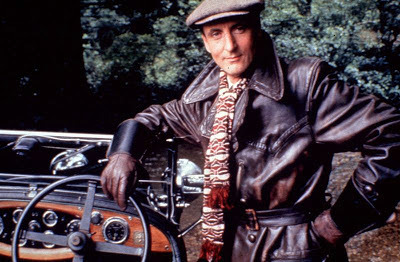 His Lagonda car, seen and discussed in the previous episode, Murder in the Mews, now gets to play centre-stage (of sorts). Firstly, in the opening scenes, he explains to Miss Lemon that his car has been accepted for the 24 Hours of Le Mans race, a fact he is only too keen to mention to Mrs Waverly on his arrival at Waverly Court. Secondly, he is impressed by Johnnie's toy racing car at dinner (a lovely touch, and the toy car is shown throughout the episode, closely associated with Johnnie - a clever choice by the director I assume). 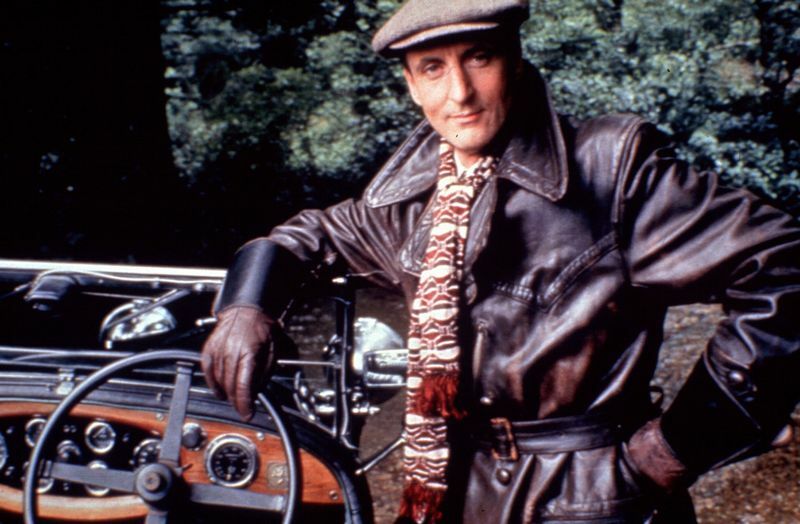 Thirdly, he drives Poirot to the village in the car, and on their way back the car breaks down (a smart move by Exton, since it conveniently delays their return and they miss the kidnapping). Throughout the rest of the episode, Hastings's attempts at repairing the car function as a sub plot. As I mentioned earlier, I find some of the additions less successful than others. Although I realise that it might have been necessary to "remove" Poirot and Hastings from the scene of the crime at the time of the kidnapping (after all, we wouldn't like to see Poirot fail - better to see Japp fail), I still think the whole 'English breakfast in the village'-thing was a bit too much. Especially the fast driving, the singing of 'One man went to mow' and the implied effect of alcohol, given the 'beer for breakfast' exchange at the village pub (I mean, would Poirot be drunk? I think not.). It is all a bit too obvious as comic relief, isn't it? Still, the scenes enabled Exton to underline Poirot's disdain of the countryside (first referred to in The Adventure of the Clapham Cook), since he has to walk back to the house (a scene reminiscent of quite a few of the later episodes set in the countryside (see, for instance, Mrs. McGinty's Dead (2008) and The Hollow (2004). I love that Poirot character traits like this one are referred to throughout the series!). Also, Exton's scenes highlight the friendship between Hastings and Poirot wonderfully, suggesting that Hastings, as the proper Englishman, in a sense is "educating" Poirot the foreigner in English customs, like the full English breakfast and the nursery rhymes. Director Renny Rye does a nice job, conveying the tension and nerves that encapsulates the Waverly family, both through several shots of four-year-old Johnnie playing and through shots of the clocks in the house. More importantly, though, I'm struck by the opening sequence in which a camera pans out from a close-up on Johnnie playing on the stairs to a full view of the front of Waverly Court. The shot cleverly conveys the two motifs of the story - children and money/honour. There are only two sets in this episode (as far as I can tell), Whitehaven Mansions and Japp's office, both of which have been seen in all previous episodes. As to locations, the village Poirot and Hastings visit is Turville in Buckinghamshire. They have breakfast at the Bull & Butcher Pub and drive past Turville Church. 'Waverly Court' is Wrotham Park, Barnet (the location was also used as Sir Roderick's home in the adaptation of Third Girl (2008)). See this wonderful website for photos. Sadly, the soundtrack for this episode has not been released. It would be lovely to see all the soundtracks from the episodes released, but I realise that it would probably be too expensive. In any case, this is not one of Gunning's most memorable themes - unlike some of the fantastic ones in later episodes. Most of the main character developments have been discussed already. Miss Lemon's meticulousness, Hastings's love of cars, Japp's professional pride and Poirot's eccentricities are all developed further. Of the latter, I would just like to point out the lovely scene in the garden of Waverly Court, in which Poirot removes a flower from the flower bed and places it in his button hole (the lapel pin vase is missing for once!) to restore the symmetry of the flower bed. Also, the scene in which Poirot reminds Miss Lemon of his tisane, which needs to be served punctually, at 11 a.m. Finally, the scene on the train in which Poirot makes his little speech about the "little policemen" we all have in our heads, a nice indirect reference to Poirot's sense of right and wrong, guilty and innocent etc. These scenes capture Poirot's character beautifully. As to the supporting characters, none of them are particularly memorable. Of course, Geoffrey Bateman (Mr. Waverly) and Julia Chambers (Mrs. Waverly) do a nice job, but they don't stand out like some of the past (and future) guest actors in the series. Wow, I'm absolutely loving these posts! They are so interesting and well-researched. Please keep up the good work! Yes I am amazed I love tbis post. I know Miss Lemon's quest to create the perfect filing system is taken right from the books (and this character seems capable of achieving that perfect system!) but in this episode it struck me that she's mostly trying to show off how perfect a partner she is for Hercule Poirot - or, at least, impress him with her "order and method." How did Waverly plan to explain suddenly having the money for the restoration work? I’ve always thought that there’s a big hole in the plot of this story. What was Waverly’s plan? That his wealthy wife would pay thousands of pounds to a “kidnapper,” (himself) and that Waverly would then use it to pay the workmen to continue renovations on the manse? That his dense wife would not notice that workmen were swarming all over the house for months? This film makes a fairly inane original plot into a nice end product. I can see why the producers put this story so early in the series, as it showcases the recurring characters very well: Poirot's devotion to moral conduct, Hastings' readiness to action, Miss Lemon's quest for perfection in her profession, and Japp's curmudgeonliness. The plot flaws are obvious: why call in a detective if you are trying to extort money from your wife? Why not use the excuse that the police won't take the case? That hole could have been plugged with one sentence about "the wife insisted I hire you." The next flaws: why doesn't doting mother insist on paying the ransom? Why have a detective witness your firing of the staff, leaving your child even more vulnerable? How are you going to explain the sudden access to money to repair the house? It's just a dopey plot, but it's filmed and acted well.